I like to buy new plants for my garden, and it was no different when I went to purchase scented geraniums for a guest post I am doing in September. I came back with 4 scented geraniums and 1 citronella lemon balm. 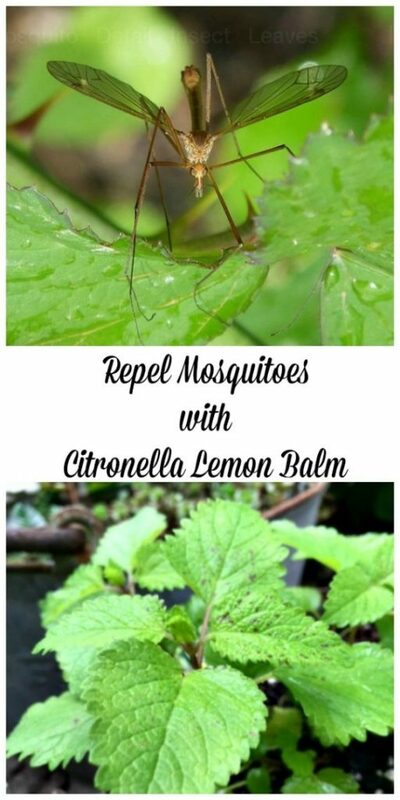 I already have lemon balm in my herb garden, but the strong scent and essential oils of the citronella variety are supposed to help repel mosquitoes and biting flies. Citronella Lemon Balm, like other mints, spreads easily. If planted directly into the garden, you can either let it run, and pull up as necessary, or plant the pot directly into a hole into ground up to the rim. This will help the spread somewhat. I like to plant my mints into pots. This way I can control the spread, and I like to move my plants around during the year. Since Citronella Lemon Balm is supposed to help repel mosquitoes and biting flies, I have placed my directly at the bottom of the deck steps on the patio. Of course, one plant won’t keep mosquitoes at bay, but when grouped with other bug repelling plants, it’s and additional weapon in your arsenal against these pests. When outside, you can grab a few of these plants, crush them, and rub on your skin. This is the same plant shown above, that was planted only a few months ago, so you can see how quickly it grows. They are easy to grow and pretty much maintenance free. I have mine in a sunny spot, but it does get early morning shade. Mints prefer some shade. I water it when it gets dry, and pinch off any dead leaves. You can also pinch it back to keep it bushy, because it will start to get leggy as it attempts to spread out.